Published: Nov. 26, 2014 at 01:17 p.m.
Last year, Chris Davis' return of a missed field goal gave Auburn an unlikely victory over top-ranked Alabama in the Iron Bowl. It's a finish many fans won't soon forget, and many called it the best college football finish of all time. What makes it so special is that the two teams combined for 22 points in the final 86 seconds of regulation, with Boise State blowing an 18-point lead and twice rallying to tie the game. The Broncos, fighting for BCS respect despite an unblemished season, scored a touchdown on a fourth-and-18, hook-and-ladder play with seven seconds left to send the game into overtime. Adrian Peterson ran for a 25-yard touchdown to open the OT scoring, but Boise State matched it, then went for two on a Statue of Liberty play and got it when RB Ian Johnson took the handoff and went untouched into the end zone. Johnson then scored again -- by proposing to his cheerleader girlfriend on the field. She said "yes." I was at this game in the Orange Bowl, and I remember it like it was yesterday. If you take out how it finished, it was still a tremendous game, with 15 long scoring drives, including five of at least 80 yards, and almost 1,300 yards of total offense. It started raining hard at halftime, but the real storm didn't hit until the final 28 seconds, just after the Hurricanes took a 45-41 lead. Starting at his own 20, BC quarterback Doug Flutie's goal was to get it near midfield and have enough time for a final-play heave. With six seconds left, and the ball resting on Miami's 48-yard line, Flutie tossed the ball 60 yards into the end zone, over the defenders' heads and into Gerard Phelan's arms for the improbable victory. Kentucky entered the game as a home underdog to the defending SEC champions. The Wildcats looked as if they would pull off the shocker after kicking a go-ahead field goal with 11 seconds to play and pinning LSU back at its own 9-yard line on the ensuing kickoff. QB Marcus Randall found Devery Henderson for a 17-yard gain to the 26 before calling a timeout with two seconds left. Kentucky players were so confident they doused coach Guy Morriss with Gatorade before the final play. But Randall slung the ball as far as he could from his own 18-yard line. It bounced off the hands of a couple of defenders at around the LSU 25 and into the hands of Henderson, who sprinted the rest of the way into the end zone. The Cornhuskers entered the game with an 8-0 record and as the top-ranked team in the nation. They also hadn't lost a Big 12 game in five years. The Tigers were unranked at 6-3 and had lost 18 straight games to Nebraska. It looked like all the streaks would come to an end when Coby Jones found a wide-open Eddie Brooks for a 15-yard touchdown, giving Missouri a 38-31 lead with 4:39 left in the game. But Scott Frost moved the Cornhuskers 60 yards in 55 seconds, getting them to the Missouri 12-yard line with seven seconds to play. On third down, Frost threw over the middle, the pass was broken up, but as it was about to hit the ground, Shevin Wiggins, the intended target, kicked it back into the air to freshman Matt Davison, who made the diving touchdown catch to send the game into overtime. Frost's 12-yard TD run in the extra period gave Nebraska the win. I've watched Alabama in pregame warmups working on stripping and tackling drills ... with offensive linemen. I asked someone once why the Tide does this, and the answer was this: "We want to be prepared for every situation -- interception returns, missed field-goal returns, everything." Well, it was exactly for moments like Saturday. Problem was, the execution failed when Chris Davis returned a missed Alabama field goal 100 yards on the final play of the game, ruining the Tide's perfect season, No. 1 ranking and likely the team's BCS title game hopes. Kordell Stewart's 64-yard Hail Mary to Michael Westbrook as time expired gave Colorado 27-26 victory over Michigan. It was the second touchdown by the Buffaloes in the last 2:16 of the game. This moment is simply known as "The Play." After Stanford takes 20-19 lead on a field goal with four seconds left, Cal uses five laterals on ensuing kickoff to score touchdown, running through members of the Cardinal band en route. 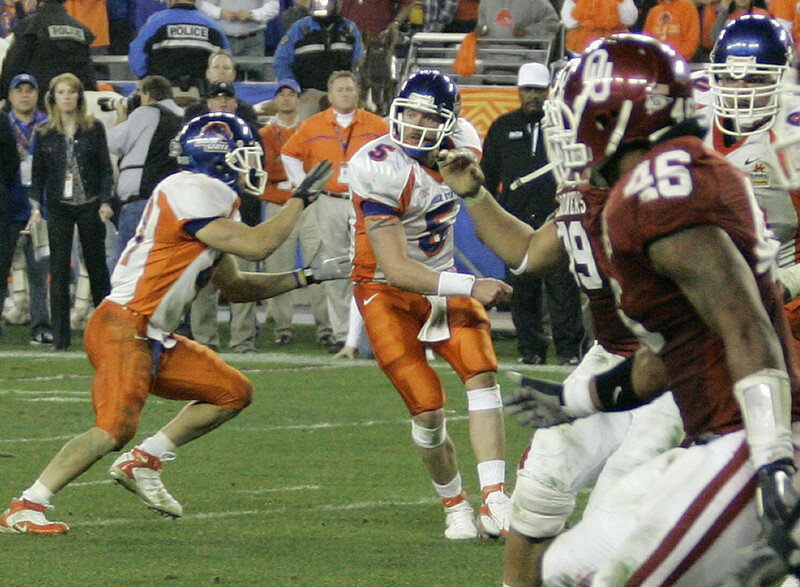 The game kept Pro Football Hall of Famer John Elway from going to a bowl game in his four-year Stanford career. Down 45-25 with less than four minutes left in the 1980 Holiday Bowl, Jim McMahon led BYU on a furious comeback, throwing three touchdown passes, including the game-winner on a Hail Mary to Clay Brown on the game's final play. This was a startling setback for SMU's "Pony Express" Mustangs, which featured Pro Football Hall of Famer Eric Dickerson and Craig James. Playing with the flu and in unseasonably cold Dallas weather, Joe Montana ate chicken soup during the game and led Notre Dame to 23 unanswered fourth-quarter points, giving Notre Dame a 35-34 victory over Houston in the 1979 Cotton Bowl. The winning score came on a Montana-to-Kris Haines TD pass with no time left. I'd like to think I had a little to do with that victory. Early in the morning of the game, Irish coach Dan Devine called the Dallas Cowboys when I was working there to ask if we had cold-weather gear; we furnished.